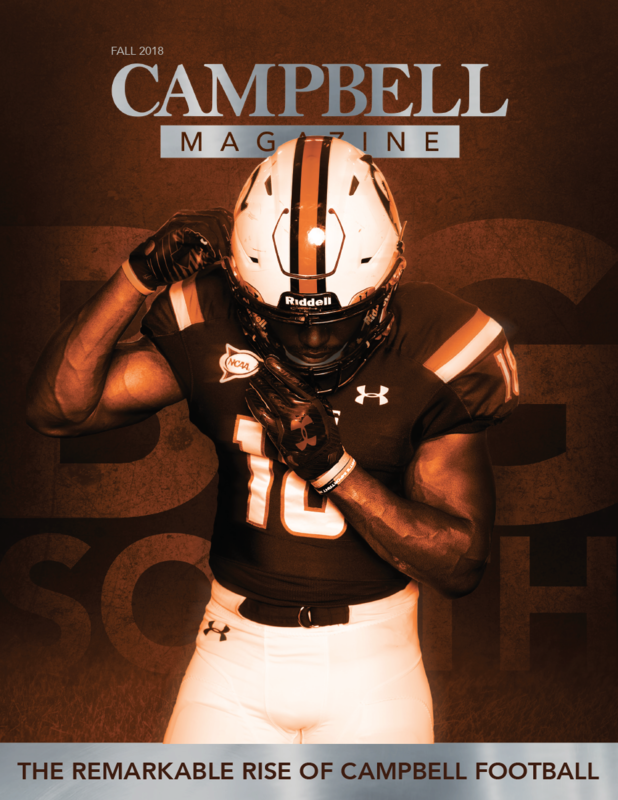 Campbell Law’s advocacy program has five national championships since 2012. This one is the first to be won by an all-female team. Alexandra Puszczynski never thought of her all-female team of student advocates as ‘all-female’ until her friends started congratulating her on the team’s historic mock trial win. “Really good” just about sums up Campbell Law’s competitive advocacy program. Student advocates have collected five national championships, six national runners up, seven national semifinalists, four regional championships and 14 national individual best advocate awards since 2012. But this is the first to be won by a team of female students. At the Capitol City Challenge National Invitational Mock Trial Competition in Washington, D.C., the Campbell team worked its way through the opening rounds to beat the University of Denver School of Law for a place in the semifinals. They then topped Stetson School of Law in the finals to bring home a championship. One of only two all-female teams at the competition last March, they were the only all-female team to pass the preliminary rounds, let alone top 23 other teams for the title. Director of Advocacy & Assistant Professor Dan Tilly assembled the winning team of three third-year law students Meredith Kittrell, Latasia Fields and Dale Stephenson (now graduates) and one second-year student, Alexandra Puszczynski. Kittrell and Fields have been contributing to those high scores since their second year, trying cases together as co-council. The pair has met with success over and over again. But in her years of competition Kittrell has observed that two-woman teams are rare. She attributes this to the fact that all co-counselors need a good dynamic to appeal to a jury. In some regions, women who are particularly strong or direct in the courtroom can come off as spiteful rather than commanding. 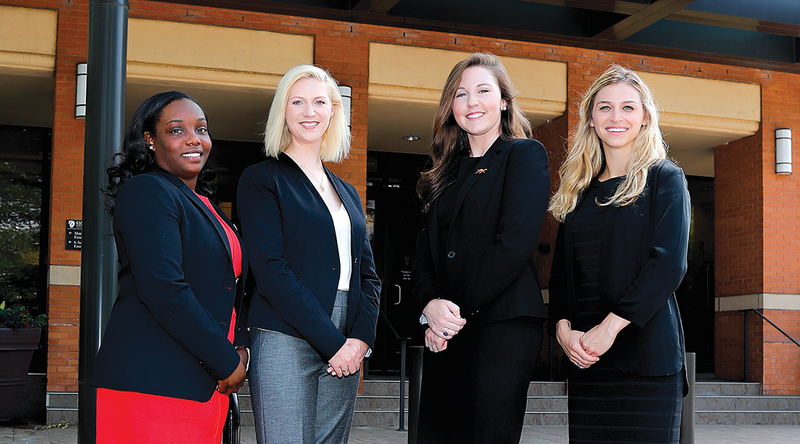 Campbell Law’s current student body is 64 percent female, and as all students gain courtroom experience during their time there, they graduate with a good understanding of the wardrobe and rhetoric of the courtroom. But a report by the legal publication Law360 found that while women make up 50.3 percent of current law school graduates, only 35 percent of lawyers at law firms are female. Gender aside, a national mock trial competition naturally poses great challenges to any team, especially those facing a deadline. Campbell’s entire trial advocacy program was busy planning and hosting their own mock trial competition until the national championship was only two weeks away, giving the students and their coaches limited time to practice. On top of assignments for other classes and personal responsibilities, the preparation for a case competition can be overwhelming. Teams are given all of the facts and are expected to know the depositions, exhibits, witnesses like the back of their hand in order to be ready to represent either side of the case at the drop of a hat. For Puszczynski, the youngest of the group, the speed of the competition was the most nerve-wracking part. During the four-day event, the team competed in the morning, found out the results during lunch, immediately grabbed their materials and set up the room for their next challenge, with no more than a few minutes to settle in. “The feel” of a competition can make a huge difference for lawyers, who depend on being able to appeal to an audience that might change from region to region. The team pointed to Kittrell as an example because of her distinct southern accent. While she tones it down to the best of her ability, judges have commented on it in competitions north of Tennessee, including the nationals in Washington. At mock trial competitions, evaluation and critique is given by the jury, which at Capitol City Challenge was made up of approximately 50 local professionals, including experienced federal and state prosecutors, public defenders, and private practice attorneys. Comments are given after each round, and can either psych you out or teach you how to up your game. Kittrell has a strategy for staying positive through a critique. Sometimes a note and a smile is the best way to respond to feedback. After weeks of preparation for a case, there’s only so much a team can change in crunch time. The Campbell team came thoroughly prepared, but still had to make a last minute PowerPoint to appeal to the judges, who wanted to see technology in use in the courtroom rather than the printed exhibit boards the team had created. “If you make a beautiful chart that you think helps your case, but you hear in three different rounds that judges don’t like the chart, you do have to adjust and remove some of what you’ve worked on in order to be successful,” said Fields. The preference for screen-based presentations at the competition might have thrown the Campbell team off guard at first, but their technological savvy helped them as they began to advance through the preliminary rounds. Student lawyers who weren’t iPad users struggled to cast their documents to the big screen and display sections of text to the audience from the tablets gracefully. Other teams handed out their exhibits in paper hard copies, which cost them points with the jury. Even without the advantage of home turf technology, the Campbell students’ individual knowledge of the case helped them present a cohesive front as a team. As witnesses, Stephenson and Puszczynski were responsible for knowing their depositions backward and forward. Kittrell recognized the value of having teammates who worked hard to comprehend every aspect of the case. The Campbell team was coached by assistant professor Anthony Ghiotto, whose hands-off approach challenged them to use one another as a soundboard and work independently. Stephenson appreciated the laid-back faculty guidance. Ghiotto was assisted by 2016 graduate and former Wallace Fellow Brittany Stiltner, who gave more direct coaching at the team’s evening practices. Even with Stiltner’s feedback, the third-year students felt uneasy entering the competition. “Making the break” is making it past the preliminary rounds for a place in the top eight teams. Once they had secured their spot in the semifinals, Fields and her team started to feel optimistic. The third-year students can remember the exact moment they knew they had a shot. While Puszczynski finishes up her last year at Campbell, Stephenson, Kittrell and Fields will start careers in personal injury defense, real estate law, and workers’ comp law, respectively. They begin the bar exam on July 24. If their time at Campbell Law is any indication, they will pass with flying colors.